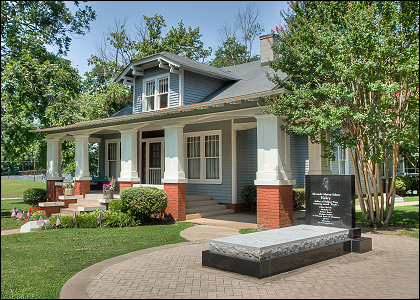 The Alex Haley House Museum and Interpretive Center has been restored to model the home as it was when Haley was born. Some of the 1919 furniture which decorates the home belonged to the Haley family. The restored building is open to the public as a Museum featuring Haley’s work, childhood memorabilia and references to the people who inspired his characters in Roots. Visitors can view the memorabilia and family artifacts that remain showcased. They also have the opportunity to make purchases at a small on-site gift shop as well as see Alex Haley’s final resting place at the front lawn of the home. Originally known as the Palmer House, this ten-room, bungalow style home was constructed in 1918 and 1919 by Will E. Palmer, the maternal grandfather of Alex Haley (1921-1992). From 1921 to 1929, and during some subsequent summers, Alex Haley lived here with his grandparents, Will and Cynthia Palmer. The front porch was often the place where young Alex heard the oral accounts of family history, including stories of Kunta Kinte, the young Mandingo man captured near his West African home. These stories inspired Haley to write about his ancestry in a book called Roots: The Saga of An American Family. This 1976 Pulitzer Prize winning novel has been translated into over 30 languages and has had great influence in stimulating the study of genealogy. In 1977, Roots was adapted for an eight-part television series, which became one of the most popular programs in television history. Two years later its sequel, Roots: The Next Generations, aired as well. On December 14, 1978, the Alex Haley House was listed in the National Register of Historic Places. It has attracted scholars and visitors from around the world. Alex Haley is buried on the grounds.